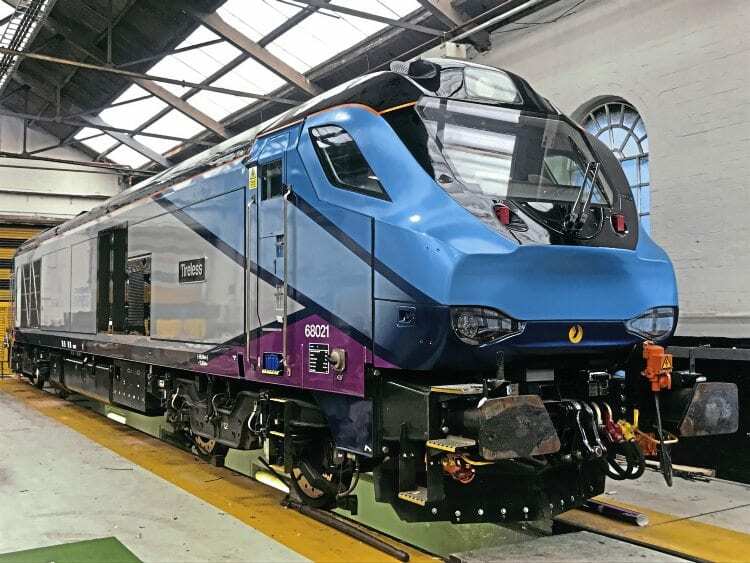 TRANSPENNINE Express has released the first official image of a Class 68 that will work its loco-hauled services from next year. No. 68021 Tireless has been vinyled at DRS Gresty Bridge depot in the TPE house colours, one of 14 locos that will be used in conjunction with the order for 65 Mk5A carriages and 14 driving trailers being built in Spain by CAF. TPE will have the rolling stock order formed into 13 five-car rakes. Class 68 No. 68021 Tireless inside the DRS workshops at Gresty Bridge, Crewe, in the TPE livery. The locos pencilled in to be sub-hired to TPE are between Nos. 68019 to 68034, and at the end of October, Nos. 68019-022 were at Crewe, and 68023-26 in store at Barrow Hill. The remainder are locos delivered this year that are being used on various duties. In addition to this stock on order, as part of a £500million overall enhancement of TPE operations, it will take delivery of 19 five-car Class 802/2 AT300 trains being built by Hitachi and 12 five-car Class 397 EMUs from CAF for North West to Scotland duties. This will allow 22 Class 185s to be taken off lease and returned to Eversholt, with TPE’s 10 Class 350/4 EMUs expected to transfer to the new West Midlands franchise. One aspect of the Class 68s being used by TPE is they have no yellow warning panel because the front-end lighting meets the latest standards.